This was our second time volunteering at JungGye orphanage. We spent 1 hour teaching children English and another hour to hangout and play with them outside. During snack time, a boy I taught last month (kindergartener) remembered me and sat next to me to eat his snacks. He made me feel special. I asked him if his liked bananas as he scrumptiously devoured a half sliced banana, he said, "Yes, I do. We don't have fruit here. I like bananas and watermelons. In summer, we have watermelons sometimes, but it's rare." I also got the privilege to hangout with the cutest little girl - she was the youngest out of the bunch. 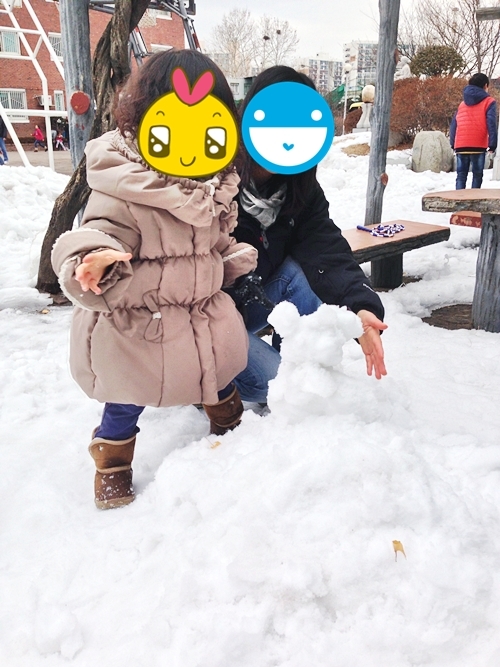 Here we are playing making her own version of snowman. We started volunteering thinking that we were doing a "good deed". After the physical presence of being there... having these kids make you smile, giggle, grin and laugh... it becomes a rather strange experience. It feels like the opposite side is getting healed (me)..